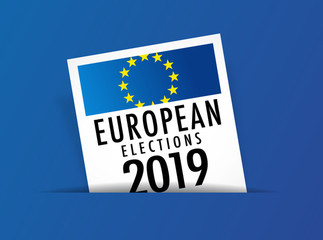 Citizens of the 27 EU member states will elect a new European Parliament in 2019. Internal tensions within the European Union and Brexit will influence these elections, as will turbulence on the international stage and migration-related and social challenges, which will result in an increase in fear, a spike in identitarian movement activity and populism. All these developments lead to a rise in populist and radical political groups that oppose European integration and, more generally, doubt the European project. This means it is unlikely that the EP elected in May will resemble the current one. The future of the European Parliament can affect the fate of the EU’s internal and external policies. Nowadays, Georgia has valid support from the EU, which is demonstrated by the resolutions/reports that have been adopted and the strong cooperation between the two sides. For instance, on November 14 the European Parliament adopted the Report on the Implementation of the EU-Georgia Association Agreement, which gives an overall positive assessment of the progress made by Georgia. It welcomes the reforms in line with the AA, praises the cross-party consensus on the European agenda and reiterates the European Parliament’s call for an ‘Eastern Partnership+’ policy to unlock additional perspectives. Georgia’s future political, economic and social development is largely dependent on European integration. Therefore, when the Union is facing an increase in Eurosceptic MPs, it is important to look at who might challenge the process of European integration and how, if at all, that might affect EU’s relations with Georgia. The first question that needs to be addressed is if Parliament, a particular institutional part of the state-like European Union, qualifies as a genuine actor in EU foreign policy and on the international scene. The simple answer is yes. The main decision-makers in EU’s Foreign & Security policy are the European Council, the High Representative of the Union and the European Commission. Traditionally, foreign policy has been dominated by member states. The 2009 Lisbon Treaty stipulated a greater role for the EP in external actions overall, however, by expanding parliamentary legitimacy and oversight: parliamentary consent is required for the accession of a new member state to the EU. 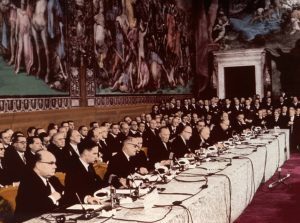 Although formally Parliament is only entitled to approve or reject accession, it still enjoys tremendous impact on both the internal and external conditions of the enlargement process. According to the former Chair of the EP’s Committee on Foreign Affairs, this is not exercised formally and is not visible in any legal process. Rather Parliament’s position is taken on board informally by the Council and Commission. Any international agreement by the EU also requires Parliament’s consent. Parliament has rarely rejected consent to an international agreement but it has delayed approval in order to ensure its positions are taken into account in the final text of the agreement. Another important instrument of the EP is parliamentary resolutions, which formulate Parliament’s position and usually refer to issues such as human rights, democracy, good governance, etc. For example, the EU adopting the Resolution on Georgia’s Breakaway Regions 10 Years after the War with Russia had significant importance as it demonstrated the Union’s strong support for country’s sovereignty and condemnation of the Russian occupation. The same can be said about the recently adopted report on the implementation of the AA between the EU and Georgia, which appraises the achievements made by Georgia and notes EU’s strong commitment to its closet Eastern partners. On Ukraine and Russia, Parliament was at the forefront of the EU’s visibility, with senior MEPs traveling to Kiev and calling for targeted sanctions as well as providing institutional support for Ukraine. The EU Parliament has shown that it can speak up and urge EU member states and institutions to act when they drag their feet. Unlike in national legislations, where the traditional government-parliament structure means the parliamentary majority normally tends to limit itself to pursuing policy positions favoured by its government, MEPs have the opportunity to take foreign policy positions/views freely without being politically obliged to support the position of the executive organs. Hence, Parliament can keep topics high on the agenda and bring the attention of the European community to a particular issue, such as EU’s neighbouring policy, including relations with Georgia. Finally, the European Parliament elects the Commission and its President and can potentially dismiss both. Based on this, it seems likely that the composition of the future European Parliament will have consequences on the future functioning of the Union and its foreign policy stances. Currently the center-right, pro-European Group of the European People’s Party (EPP) dominates Parliament with 219 seats; the Group of the Progressive Alliance of Socialists and Democrats (S&D) comes second with 187 seats; right-wing eurosceptic European Conservatives and Reformists Group (ECR) has 73 seats; the Group of Alliance and Liberals and Democrats for Europe (ALDE) makes up 68 seats; the Group of the Greens/European Free Alliance has 52 seats; the socialist European United Left–Nordic Green Left (GUE/NGL) has 51 MEPs; the EFDD (which includes the British UKIP party and the Five Star Movement) currently has 45 members; and the ENF (which includes Marine Le Pen’s National Rally party and Matteo Salvini’s Lega party) have 35 seats, making it the smallest group in the EP. 21 MEPs are non-attached. 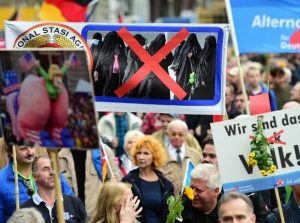 The rise of radical groups from both the right and left of the political spectrum has been a growing concern in Brussels and other key EU capitals. In the wake of Brexit and some electoral successes at the national level in Italy and Austria, for example, it might seem like this is the best opportunity radical groups may ever get to come to power at the European level, but their success is still unlikely. First, due to its strong voter support, the center-right European People’s Party (EPP) is likely to remain the dominant political force in the chamber. Secondly, the departure of British MEPs from the conservative and UKIP parties will weaken the nationalist camp, even if this departure will be offset by the arrival of a large number of Lega Nord MPs from Italy (currently 28 seats), as well as Alternative for Germany (AfD) MPs from Germany (15 seats). The loss of 18 British MEPs from the ECR group will make a big difference to the party’s strategy and could threaten its very existence. In addition, it is not likely that these political parties, which have different positions on the Euro, migration, foreign and internal policy, will work together or form a coherent unit. All signs point to these parties having more differences than similarities. For example, at present, the ENF is primarily pro-Russian due to the large number of western European members. As such, the western right prefers to find pro-Putin allies while the eastern right is generally anti-Russia. They could, however, form an “against” bloc, which has sometimes obliged other groups to form a coalition since 2014. The challenging process of Britain’s departure and the potential for a hard Brexit might be making the idea of leaving the EU club less attractive for some European voters. Steve Bannon, President Donald Trump’s former political strategist, set up the Movement, an alliance of right-wing populist parties with the purpose of contesting the European elections. However, the Movement has so far been snubbed by the Alternative for Germany, Freedom Party of Austria and UKIP. Fleishman Hillard, the leading EU government relations, public affairs and communications consultancy in Brussels, made a projection on the next mandate using data from public opinion polls on national parties across EU countries as a proxy for votes for parties in the European Parliament. According to that the results, center-ground parties will remain the dominant presence in Parliament although they will lose some seats. 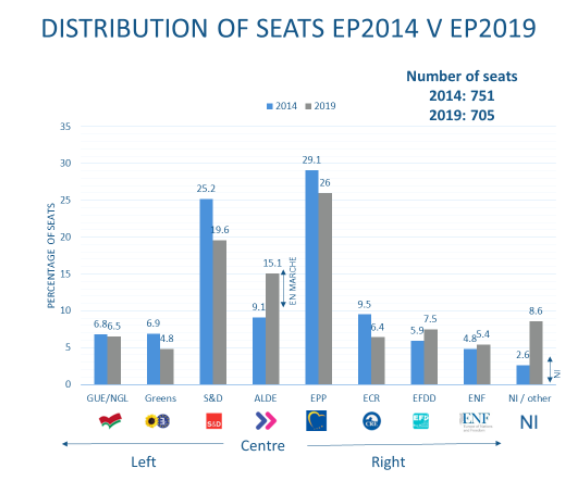 ENF could progress from 35 to 59 members, EFDD from 45 to 53, and ECR could slip from 71 to 48, for a total of 160 members across the three groups, up from 151. While most Europeans say they appreciate the EU more than ever, they appreciate the Continent’s traditional centrist parties less than ever. The Socialists in particular are in trouble: expected poor showings in nearly all the big EU countries, including Germany, France, Italy and Poland, mean dozens of Socialist seats are at risk, and with them Parliament’s pro-EU majority. Possible socialist replacements in the political center, such as Emmanuel Macron’s mooted Europe En Marche party, have so far failed to materialize. Talks are still going on about Macron’s party joining the ALDE, but En Marche is expected to try to form a new parliamentary group of pro-European centrists who support Macron’s plans to reform European institutions, thus drawing members from ALDE, EPP and S&D. All of this fragmentation and instability causes uncertainty for policy-making in the next mandate, therefore there are increased efforts to get out the vote, especially among pro-European Union political actors. From the very beginning, the European project has felt under threat to some extent, and, not surprisingly, this is the case today. Populist and radical parties will most likely gain more votes than in 2014 but their plan to blow up the Assembly’s politics in 2019, including making the EU less integrated and more isolated, is less likely to be realized. The latest Eurobarometer polls indicate there is good news for Eurocrats and politicians preparing for next year’s election: 62% of Europeans believe that their country’s EU membership is a good thing, the highest indicator since the period between the fall of the Berlin wall in 1989 and the adoption of the Maastricht Treaty in 1992. Populists will most likely hold between 20–25% of seats in Parliament (they hold 20% now) and it will be difficult for them to form a coherent group, except possibly a negatively cohesive one. In truth, the presence of populists is, and will be, more tangible in the Council than in Parliament, particularly due to voting rules. In a number of areas outside the scope of the Council/Parliament co-decision procedure, only the Council decides — often unanimously, which can provide room for radicals since the Council includes heads of government and sectoral ministers with close ties to populist or extremist movements that block decisions. The European Council, which defines overall political guidelines, adopts them by consensus. In its areas of competence, Parliament can deliver progress and/or compromise depending on applicable voting rules, which sidestep or even exclude populist and extremist elements within it. From Georgia’s perspective, it appears that the EP elections will not have a direct or drastic impact on the country and its existing and future relations with the EU. First, one term of Parliament is too short to influence Georgian-EU relations immediately. Implementing the Association Agreement and all its responsibilities will take longer and the assessment of this process requires a long-term perspective. Second, EPP and S&D, together with liberals, will still be more influential and stronger political forces in the EP than the populists; it is likely that the EPP and S&D will take the highest-ranking offices, such as President of the Parliament and the President of the Commission. Therefore, Georgia will be able to continue counting on their support and those political groups will be able to keep relations with the EaP countries on Parliament’s agenda as one of the important directions of the EU’s foreign policy. During the November 2018 plenary discussions, MEPs from both EPP and S&D once again expressed their strong commitment and support for Georgia and its European path. In addition, even the rise of populist parties is not a direct threat to EU’s cooperation with the EaP countries — it is still too early to talk about the EaP counties’ membership in the EU, something radical groups would most likely openly oppose. On the other hand, the potential loss of some seats for S&D and EPP could have an effect on the size of the arena for leading Georgian political parties as ruling party Georgian Dream – Democratic Georgia is a sister party of the S&D  and leading opposition party United National Movement is affiliated with the EPP. These parties might need to deepen their advocacy and lobbying activities in the EU capital. Finally, strengthened nationalist power in the European Parliament means it is more likely that EU-Georgia relations and cooperation will be subject to more scrutiny. However, a “tough judge” can be a good conditional variable for Georgia to become even more methodical and precise with its steps and reforms towards further European integration. **The blog is prepared within the framework of the project – “Promoting an informed engagement by civil society and youth in Europeanization in Georgia” -financially supported by the Embassy of the Republic of Lithuania to Georgia. The views and opinions expressed in this article are the author’s alone and do not necessarily reflect the views of the Georgian Institute of Politics or the Embassy of the Republic of Lithuania to Georgia.